I first heard about Edward McConville almost 30 years ago. I was reading Dee Brown's popular book about the story of Chief Joseph and the Nez Pierce Indians, "I Will Fight No More Forever". I was surprised to find a number of references to a militia colonel named McConville. Since then I've tried to find out more about him and his life. About 3 years ago when Susan and I were in San Diego, I came across the sad footnote to the story of Edward McConville at the bottom of this page . Born 25 June 1846 in Cape Vincent NY, Edward McConville served with the 13th New York Cavalry during the Civil War (1860 - 1865). After the war, he enlisted in the 21st U.S. Infantry and fought against the Apache in Arizona, mustering out in 1871. Moving to the Idaho Territory, he served in the Nez Perce War of 1877 as an officer of the local militia supporting General O.O. Howard's campaign against Chief Joseph. 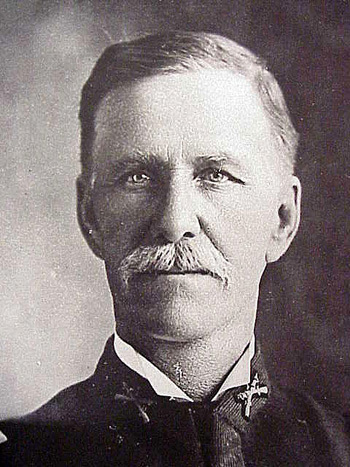 He later served as a colonel in the local militia regiment in the Bannock War (1878). 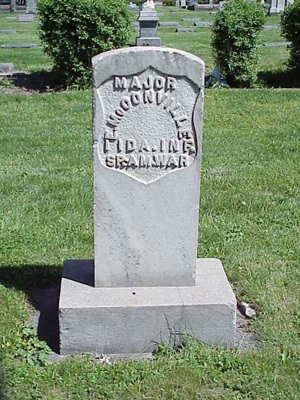 In 1898 he volunteered for the 1st Idaho Volunteers (now the Idaho National Guard) and served a battalion commander. On 5 February 1899, he was killed in action against the forces of General Antonio Luna at the Battle of La Loma in the Philippines. "MR. McCONVILLE IS MISSING: A visitor at the Museum inquired recently about a bronze statue of John McConville which, he stated, was in Balboa Park in 1940 but is not there now. No one seems to know what became of it--or even to recall it, for that matter. The visitor, who was from Idaho, is the grandson of McConville's brother."